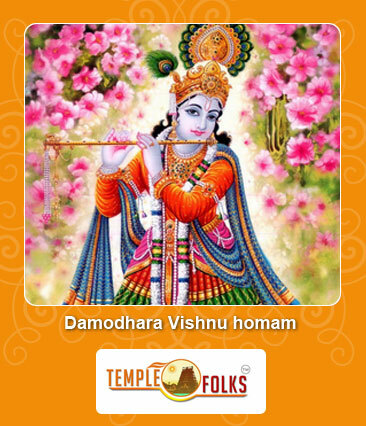 Damodhara is a popular name of Lord Vishnu who blesses his devotees to manage difficult situations in life. In fact, he plays a key role in safeguarding people from enemies and evil forces by destroying them. It has been proved that anyone who conducts homam on Lord Vishnu will get major benefits to reach next levels. Damodhara Vishnu homam is mainly meant for overcoming several obstacles in life to ensure peace of mind. It also helps to ensure overall wealth by minimizing complications. A homam is mainly meant for getting solutions for all types of problems in life by addressing exact needs. Damodhara Vishnu homam is a suitable one for those who want to recover from karma, dosha and other problems. This homam provides methods for reducing threats from the bad position of planets in a birth chart. Furthermore, one can able to ensure more protection with this homam by meeting essential requirements. People who want to gain spiritual knowledge and wisdom can choose Damodhara Vishnu homam for achieving goals in life to a wider extent. In addition, it is possible to overcome the negative effects of different planets in a birth chart with this homam. Another advantage is that it shows ways for witnessing major changes in life. Whenever a person wants to conduct Damodhara Vishnu homam, it is advisable to consult with a leading Vedic firm for obtaining best results. Vedic folks is a leading Vedic company which offers valuable services while organizing the event. Vedic scholars will chant mantras from Vedic scriptures along with fire rituals for getting the blessings from Lord Vishnu. Online services are also available for those who want to book homam in advance to plan it depending on the needs. Even though there are fixed timings to conduct such Homas, your horoscope will be analyzed by our Vedic Astrologers, according to which the time slots are arranged.